Click the button below to download the form for the activity on Friday, December 18th if your school will have game systems for your students to critique. Your teacher will assign a console to you. You will do research on the system and fill out the linked form. Make sure you choose the right form for your school or your teacher will not get your responses. Then you will report your findings to the class. On Friday Dec. 18th we will learn about the video game industry, and if your teacher is participating, get an opportunity to play some of the systems below. All information below is from Wikipedia, the free encyclopedia. General background information about the systems for the pre-video game industry day activity. Click the image of the console to go to the Google Search for that system. 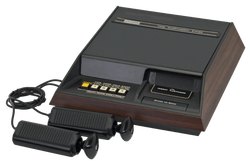 The Magnavox Odyssey is the world's first commercial home video game console. It was first demonstrated in April 1972 and released in August of that year, predating the Atari Pong home consoles by three years. It is a digital video game console, though is often mistakenly believed to be analog, due to misunderstanding of its hardware design. The Odyssey was designed by Ralph Baer, who began around 1966 and had a working prototype finished by 1968. Pong is a two-dimensional sports game that simulates table tennis. The player controls an in-game paddle by moving it vertically across the left side of the screen, and can compete against either a computer controlled opponent or another player controlling a second paddle on the opposing side. Players use the paddles to hit a ball back and forth. The aim is for a player to earn more points than the opponent; points are earned when one fails to return the ball to the other. Pong was the first game developed by Atari Inc., incorporated in June 1972 by Nolan Bushnell and Ted Dabney. The Intellivision is a video game console released by Mattel in 1979. Development of the console began in 1978, less than a year after the introduction of its main competitor, the Atari 2600. The word intellivision is a portmanteau of "intelligent television". Over 3 million Intellivision units were sold and a total of 125 games were released for the console. The console was test marketed in Fresno,California, in 1979 with a total of four games available, and was released nationwide in 1980 with a price tag of US$299 and a pack-in game: Las Vegas Poker & Blackjack. The Atari 2600 is a video game console released in September 1977 by Atari, Inc. It is credited with popularizing the use of microprocessor-based hardware and ROM cartridges containing game code, instead of having non-microprocessor dedicated hardware with all games built in. The first game console to use this format was the Fairchild Channel F; however, the Atari 2600 receives credit for making the plug-in concept popular among the game-playing public. The ColecoVision is Coleco Industries' second generation home video game console, which was released in August 1982. The ColecoVision offered near-arcade-qualitygraphics and gaming style along with the means to expand the system's basic hardware. Released with a catalog of 12 launch titles, with an additional 10 games announced for 1982, approximately 145 titles in total were published as ROM cartridges for the system between 1982 and 1984. River West Brands currently owns the ColecoVision brand name. The Sega Genesis, is a 16-bit video game console developed, manufactured, and marketed by Sega Enterprises, Ltd. first released in Japan in 1988 and later released worldwide. It is Sega's third and most successful console in terms of both sales and marketshare, selling well in North America and Europe, and less so in Japan. Its arcade game ports, first Sonic the Hedgehog release, wide array of first and third-party sports titles, and aggressive youth marketing greatly contributed to its success. The Sega Saturn, is a 32-bit fifth-generation video game console that was first released by Sega on May 11, 1995 in North America. The Saturn had impressive hardware at the time of its release, but its design, with two CPUs and six other processors, made harnessing this power extremely difficult for developers accustomed to conventional programming. The Super Nintendo Entertainment System is a 16-bit video game console that was released in North America in 1991. The Super Nintendo Entertainment System is Nintendo's second home console, following the Nintendo Entertainment System (NES). The console introduced advanced graphics and sound capabilities compared with other consoles at the time. Additionally, development of a variety of enhancement chips (which were integrated on game circuit boards) helped to keep it competitive in the marketplace. is Nintendo's third home video game console for the international market. Named for its 64-bit central processing unit, it was released in September 1996 in North America. It is Nintendo's last home console to use ROM cartridges to store games. As part of the fifth generation of gaming, it primarily competed with the PlayStation and the Sega Saturn. The GameCube The GameCube was the first Nintendo console to use optical discs for its primary storage medium. The discs are similar to the miniDVD format, and as a result of their smaller size, the system was not designed to play standard DVDs or audio CDs. Nintendo also introduced a variety of connectivity options for the GameCube. It was the first Nintendo console to support online gaming, which relied on the use of an add-on broadband or modem adapter that was sold separately. Game support and availability of the adapter was, however, very limited. The GameCube also supported connectivity to the Game Boy Advance, allowing players to access exclusive in-game features using the handheld as a second screen and controller. The Neo Geo is a cartridge-based arcade system board and home video game console released on January 31, 1990 by Japanese game company SNK Playmore. Being in the fourth generation of video game consoles, it was the first system in the Neo Geo family, which ran throughout the 1990s before being revived in December 2012 with theNeo Geo X handheld and home system. The original system's hardware featured comparatively colorful 2D graphics. The Dreamcast is a video game console that was released by Sega in 1999. With a strong marketing campaign and reformed studios to develop new creative content, the Dreamcast was initially well received with a very successful launch and strong sales. However when Sony announced the PlayStation 2, sales of the Dreamcast quickly plummeted, due in no small part to the console's inability to support movies on the new DVD format. Despite its short lifespan, the Dreamcast was widely hailed as ahead of its time. The Wii is a home video game console released by Nintendo on November 19, 2006. As a seventh-generation console, the Wii competes with Microsoft's Xbox 360 and Sony's PlayStation 3. Nintendo states that its console targets a broader demographic than that of the two others. The Wii introduced the Wii Remote controller, which can be used as a handheld pointing device and which detects movement in three dimensions. Another notable feature of the console is WiiConnect24, which enables it to receive messages and updates over the Internet while in standby mode. Like other seventh-generation consoles, it features a game download service, called "Virtual Console", which features emulated games from past systems. series of consoles and handheld game devices. As part of the fifth-generation of gaming, it primarily competed with the Nintendo 64and the Sega Saturn. and Europe later the same year. The sixth-generation console competed with the Sega Dreamcast, Microsoft Xbox, and Nintendo GameCube. The PlayStation 2 went on to become the best-selling video game console, selling over 150 million units. More than 3,800 game titles have been released for the PS2 since launch. The PlayStation 3 is a home video game console produced by Sony Computer Entertainment. 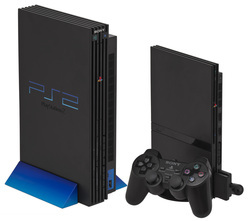 It is the successor to the PlayStation 2, as part of the PlayStation series. The PlayStation 3 competes with Microsoft's Xbox 360 and Nintendo's Wii as part of the seventh generation of video game consoles. It was the first console to use Blu-ray Disc as its primary storage medium. Major features of the console include its unified online gaming service, the PlayStation Network, and its connectivity with the PlayStation Portable andPlayStation Vita. PlayStation 4 (PS4) is a video game console from Sony Computer Entertainment. Announced as the successor to PlayStation 3. It competes with Nintendo's Wii U and Microsoft's Xbox One, as one of the eighth generation of video game consoles. Sony intends more focus on social gameplay, incorporating a "share" button on the new controller and enabling a view of in-game play streamed live from friends. The console enables interactivity with other services and devices through the following methods: Gaikai, a cloud-based gaming service that offers streaming video game content; PlayStation App, designed to enhance gameplay by using smartphones and tablets as a second screen; and PlayStation Vita's design for playing a majority of PlayStation 4 games through wireless Remote Play. The original Xbox was released on November 15, 2001 in North America. It was Microsoft's first foray into the gaming console market. As part of the sixth-generation of gaming, the Xbox competed with Sony's PlayStation 2, Sega's Dreamcast (which stopped American sales before the Xbox went on sale), and Nintendo's GameCube. The Xbox 360 is the second video game console developed by and produced for Microsoft and the successor to the Xbox. 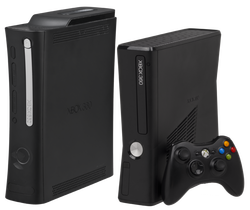 The Xbox 360 competes with Sony's PlayStation 3 andNintendo's Wii as part of the seventh generation of video game consoles. As is typical of seventh-generation consoles, the Xbox 360 features an online service (called Xbox Live), used to download games (using Xbox Live Arcade) and game demos, music, and video media. It can also be used to play back media using Windows Media Center. However, unlike other seventh-generation consoles, a monthly fee must be paid to compete in online games, or to use (often region-specific) third-party media streaming applications. 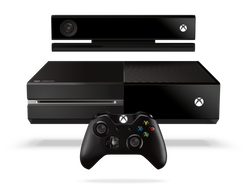 Xbox One is a video game console developed and manufactured by Microsoft. Announced on May 21, 2013, it is the successor to the Xbox 360 and is the third console in the Xbox family. It directly competes with Sony's PlayStation 4 and Nintendo's Wii U as part of the eighth generation of video game consoles. The console includes a newly upgraded Kinect motion sensing peripheral, previously an optional attachment for the Xbox 360. Microsoft is emphasizing the Kinect's integration with Xbox One through features such as a built-in Skype client for videoconferencing, user recognition and tracking, and the ability to use voice commands and gestures to navigate the console's user interface. New gaming functionality will include an expanded Xbox Live service, improved Kinect functionality, cloud computing, the ability to automatically record and share video highlights from gameplay, and support for live streaming gameplay online. Wii U is a video game console from Nintendo and the successor to the Wii. The system was released on November 18, 2012, in North America. It is the first entry in the eighth generation of video game home consoles. Currently, it competes with Sony's PlayStation 4 and Microsoft's Xbox One. The Wii U's primary controller is the Wii U GamePad, which features an embedded touchscreen. The touchscreen is used to supplement the main gameplay shown on the television or, with games supporting Off-TV Play, can allow the player to continue playing games by displaying the main gameplay even when the television is off. In addition to the Wii U GamePad, a more traditional controller, called the Wii U Pro Controller, may be used. The system is backward compatible with Wii, and Wii U games may support compatibility with Wii peripherals, such as the Wii Remote and the Nunchuk. 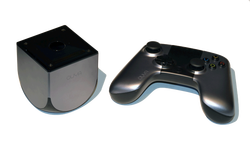 The Ouya is a microconsole running its own version of the Android operating system, developed by Boxer8. The console was released to the general public on June 25, 2013, and features an exclusive Ouya store for applications and games designed specifically for the Ouya platform, of which the majority are casual games targeted at or used by a mass audience of casual gamers. Out of the box, Ouya supports media apps such as TwitchTV and XBMC media player. It runs a modified version of Android 4.1 Jelly Bean, and is open to rooting without voiding the warranty (developer models ordered during the Kickstarter campaign for $699 or $1,337 come pre-rooted). The console's hardware design allows it to be easily opened up, requiring only a standard screwdriver for easy modding and possible hardware addons.